In the year 177, Pothinus, the 90-year-old bishop of Lyons (in modern France), died after Romans beat him for two days. Pothinus' crime: insisting that Christ was the Christian God. Terrible persecution had come upon the Christians of Lyons and the neighboring city of Vienne, some 16 miles south on the east bank of the Rhone River. Christians were burned alive in the amphitheater. The young servant girl Blandina, after many tortures, was finally gored to death by a bull. Each martyr sacrificed himself or herself in imitation of the passion of Christ, their Incarnate God, in the hope of resurrection. So fundamental and pervasive was their resurrection-faith that the Romans cremated the martyrs' corpses and dispersed the ashes in the river to defeat any notion that the Christians would be raised bodily from their graves. Pothinus's successor was named Irenaeus, meaning “man of peace,” and the early Christian historian Eusebius honored Irenaeus as a peacemaker in keeping with his name. 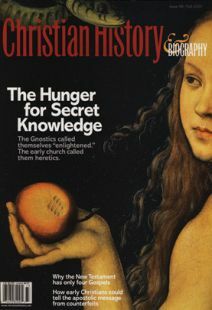 But this irenic pastor and diplomat was also the second-century church's most informed, prolific, and theologically profound opponent of Gnosticism. Earlier Christian leaders such as Ignatius of Antioch and Justin Martyr had argued against false teachings that resembled Gnosticism, but Irenaeus was unique in his careful study of Gnostic myths (especially those taught by Valentinus) and in his immense, tireless reply. Irenaeus was born sometime between 130 and 140 in Smyrna—today the city of Izmir in Turkey. As one strolls through the ruins of the ancient marketplace with its impressive colonnades, it is not hard to imagine the boy Irenaeus skipping by the altar of Zeus or observing Polycarp, the bishop of Smyrna, in theological discussion with the future Roman presbyter, Florinus, who later embraced the Gnostic ideas of Valentinus. In his youth, Irenaeus learned the key components of the Christian faith under Polycarp, who had been taught by the apostle John and others who had seen Christ. Martyrdom was never far from Irenaeus. Polycarp was killed in February of 155/56. An account left by the church of Smyrna, The Martyrdom of Polycarp, provides a window into the faithfulness of an old man who saw himself as sharing in the sufferings of Christ and hoped for the resurrection of the body. Irenaeus moved from Smyrna to Lyons (then called Lugdunum) and became a presbyter there. He was a trusted emissary of peace and on at least two occasions represented the church in doctrinal and liturgical controversies. The great persecution of Christians in Lyons occurred during one of his diplomatic missions to Rome, and so, when he returned, he became bishop in Pothinus' place. Irenaeus wrote a number of books in his pastoral role, including Proof of the Apostolic Preaching, a short presentation of Christian faith. But his greatest literary work was the five-volume Against Heresies, written around 180 in response to the Gnostics and also the heretic Marcion. It is still valued today, not only because it is an early example of Christian biblical interpretation and theology, but also because it gives a careful account of a variety of Gnostic beliefs. Irenaeus broke new ground by consulting the Gnostic teachers and reading their literature in order to understand their teachings. He occasionally exaggerated his descriptions for the sake of argument, but now that we have access to many Gnostic writings from the Nag Hammadi collection, we know that his representations of Gnosticism were generally quite accurate. As he wrote these words, Irenaeus had in mind Jesus' warning in Matthew 7:15 about false prophets who come in sheep's clothing but are inwardly ravenous wolves. The Gnostics sounded, and frequently acted, just like orthodox Christians. They read the Bible, used the Bible, and cited the Bible. But the way they understood the Bible, the way they put its pieces together, differed dramatically from the perspectives of Irenaeus, Pothinus, Polycarp, and John. The Gnostics who threatened Irenaeus's community tended to divide things into two realities—one good, the other bad. In response to such dualism, Irenaeus presented the unity of apostolic faith. But Irenaeus was too familiar with the constant threat of martyrdom to let such dualism deceive his flock. The real, bloody passion and death of Christ was a fundamental element of Christian faith. Martyrdom imitated it, and Christians confessed it in baptism and worship. Irenaeus responded with a strong biblical statement that Jesus Christ was one person, both divine and human, and that he really was crucified. At the root of the Valentinian Gnostic myth known by Irenaeus was a division between two Gods: the supreme, transcendent Father revealed by Christ, and the arrogant Demiurge, the creator of the physical world, who was identified with the Old Testament God of the Jews. Therefore, the Gnostics divided reality into two opposing realms—the heavenly world of spiritual beings (named “Aeons”) and the material world of trees, rocks, earth, flesh, and blood. In contrast to this, Irenaeus declared: “But there is one only God … He is Father, He is God, He the founder, He the Maker, He the Creator, … He it is whom the law proclaims, whom the prophets preach, whom Christ reveals, whom the Apostles make known to us, and in whom the church believes.” These words reveal another important theme for Irenaeus: the harmony between the Old Testament and the emerging New Testament, between the prophets and apostles. The Creator spoken of by Moses is the Father revealed in Christ. His redemptive plan has been the same throughout history. The Valentinian Gnostics also taught that, since the material world was created by an imposter, an ignorant deity, it had no value and must perish. The human body, as part of the material world, could never be immortal. This is why Christ could not have been truly human and why, the Gnostics believed, there would be no bodily resurrection or redemption of the created order. Salvation was purely spiritual. But according to Irenaeus, the “spiritual” person is made up of the “the union of [material] flesh and [the human] spirit, receiving the Spirit of God.” God created the physical world, and so that world has value and will be redeemed and renewed someday. God created the human body, and the body will be raised again incorruptible and immortal. The Gnostics had an elitist understanding of salvation; they divided humanity into two categories, the “spiritual ones” who belong to the Father and the “material ones” who belong to the Demiurge. As the “spiritual ones,” the Gnostic believed, they were destined for salvation because of the divine spark within them (unlike the rest of humanity, who are asleep and have no hope). So we see in Irenaeus the great orthodox doctrines of unity: One God, who is the Father and Creator of all things, immaterial and material, and who orchestrates one harmonious history of revelation and redemption; one Savior, who is both divine spirit and human flesh, both Christ and Jesus; one human nature, which is both spiritual and fleshly; one salvation of both the spiritual and material realms, which is by faith. These were the doctrines Irenaeus received from those who had passed the apostolic teaching down to him. This was the orthodoxy that protected his flock against the wolves of heresy and that gave Polycarp and the martyrs of Lyons and Vienne the faith to endure even to the end. D. Jeffrey Bingham is chair and professor of theological studies at Dallas Theological Seminary.